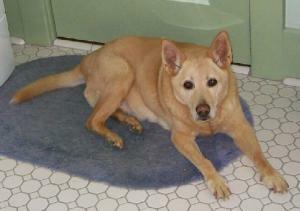 Our Beautiful Girl Ginger enriched our lives for 16 years and 4 months. Her heart murmur turned into heart failure and her decline was gradual but worsened during the the week of August 13th and she was given the gift of euthanasia, in her home, among her family. She went to Dog Heaven at 150pm August 23rd. Her passing was peaceful and trama free, with the compassionate assistance of Dr. Annie Forslund of Home Pet Euthanasia Of Southern California. Her passing has left her family severly saddened with empty hearts - we lover her so! She as an absolute Angel. "Grieve Not - Nor Speak of Me with Tears - But laugh and Talk of Me as if I Were Here Beside You - I Loved You So - It Was Heaven Here With You."